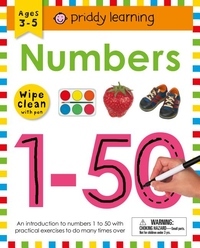 Boost your child's confidence by helping them learn to recognize and write their first 50 numbers with this wipe-clean workbook. On each page there are number outlines to trace over, with an area for free-hand copying. Included with the book is a special pen, and the wipe-clean pages enable children to practice over and over to improve their pen control and writing skills until they have mastered number formation. With bright photographic images to engage and encourage, this early-learning workbook will support your child during their early school years.